Jason practices exclusively in the areas of plaintiffs’ personal injury law, employment law, and whistleblower litigation. A Mountain States Super Lawyer in Plaintiff Personal Injury Law, an A/V-rated attorney with Martindale-Hubbell, and a former President of the Idaho Trial Lawyers Association, he has handled injury and death cases involving all types of motor vehicles, premises liability, product liability, and medical malpractice. His concentration in employment law focuses on employees’ statutory rights. Having graduated in 1996 from the Washburn University School of Law with honors, where he was a member of the Washburn Law Journal and the Moot Court Honor Society, his legal training followed the award of his bachelor’s degrees in Latin and ancient Greek from Dickinson College in 1991. In addition to practicing law, Jason has taught classical studies at several schools. He is admitted to practice before all state and federal courts in Idaho and the Ninth Circuit Court of Appeals; he has been admitted to practice in numerous, other federal district court for individual cases. 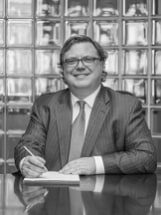 For the past nineteen years, he has been regularly and consistently engaged in civil trial practice on behalf of plaintiffs; he both resides and offices in Boise. When not working, Jason spends as much time as possible in Idaho’s mountains and rivers.